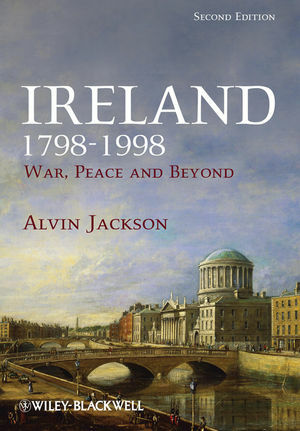 Receiving widespread critical acclaim when first published, Ireland 1798-1998 has been revised to include coverage of the most recent developments. Jackson’s stylish and impartial interpretation continues to provide the most up-to-date and important survey of 200 years of Irish history. Alvin Jackson is Richard Lodge Professor of History at the University of Edinburgh. He was previously Professor of Modern Irish History at the Queen's University of Belfast, Lecturer in Modern Irish History at University College Dublin and John Burns Visiting Professor at Boston College. His earlier publications include The Ulster Party (1989), Colonel Edward Saunderson: Land and Loyalty in Victorian Ireland (1995) and Home Rule: An Irish History 1800-2000 (2003). 1.1 Ends of the Century. 1.2 Modes and Frameworks of Interpretation. 2 The Birth of Modern Irish Politics, 1790–8. 2.1 The Origins of the Crisis. 2.2 Constitutional Radicalism to Revolution, 1791–8. 3 Disuniting Kingdoms, Emancipating Catholics, 1799–1850. 3.2 The Catholic Question, 1799–1829. 3.3 Justice for Ireland, 1830–41. 3.4 Utilitarians and Romantics, 1841–8. 3.5 The Orange Party, 1798–1853. 4 The Ascendancy of the Land Question, 1845–91. 4.1 Guilty Men and the Great Famine. 4.4 Home Rule: A First Definition. 4.5 Idealists and Technicians: The Parnellite Party, 1880–6. 4.6 A Union of Hearts and a Broken Marriage: Parnellism, 1886–91. 5 Greening the Red, White and Blue: The End of the Union, 1891–1921. 5.1 The Irish Parliamentary Party, 1891–1914. 5.2 Paths to the Post Office: Alternatives to the Irish Parliamentary Party, 1891–1914. 5.3 The Parliamentarians and their Enemies, 1914–18. 5.4 Making and Unmaking Unionism, 1853–1921. 5.5 Other Men’s Wounds: The Troubles, 1919–21. 5.6 Trucileers, Staters and Irregulars. 6 'Three Quarters of a Nation Once Again': Independent Ireland. 6.2 Manifest Destiny: De Valera’s Ireland, 1932–48. 6.3 Towards a Redefinition of the National Ideal, 1948–58. 6.4 The Age of Lemass, 1957–73. 7 Northern Ireland, 1920–72: Specials, Peelers and Provos. 8 The Two Irelands, 1973–98. 9 Ireland in the New Millennium. 9.3 The End of Irish History?